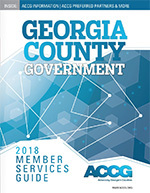 Each summer, ACCG produces a Member Services Guide as a resource for Georgia counties. The Member Services Guide highlights programs and services provided by ACCG’s Preferred Partners and also provides a comprehensive listing of all businesses that are part of ACCG’s Partners Program. Other businesses and organizations also are able to showcase their areas of expertise by purchasing advertising in this publication. ACCG encourages county officials to turn to the Member Services Guide as one of your first resources when seeking a vendor for a specific need. For more information on the Member Services Guide, contact ACCG Communications Manager Schuyler Harding at sharding@accg.org or (404) 522-5022. For advertising information for the ACCG Member Services Guide as well as Georgia County Government magazine and the monthly CountyLine e-newsletter, contact Robert Kramer at (770) 810-6981 or rkramer@naylor.com. Please check the 2018 ACCG Media Guide for advertising rates and sizes.